Headlines last week focused on negotiations between the Chicago Public Schools (CPS) board and the Chicago Teachers Union (CTU). Talks are not going well, with each side pointing to serious consequences if no agreement can be reached. But behind those headlines, more significant issues remain to be tackled. The board was offering $1,500 per year of service to teachers of retirement age and $750 to support staff to leave, according to the CTU. If at least 1,500 teachers and 700 other staffers took advantage of the buyout offer, the contract would stand, according to the CPS offer. But, if not enough employees signed up for early retirement, then CPS could reopen the contract—which union members feared would lead to layoffs. CPS officials project that this plan would save the district as much as $70 million in years three and four, an amount equal to the salary increases included in the proposals. 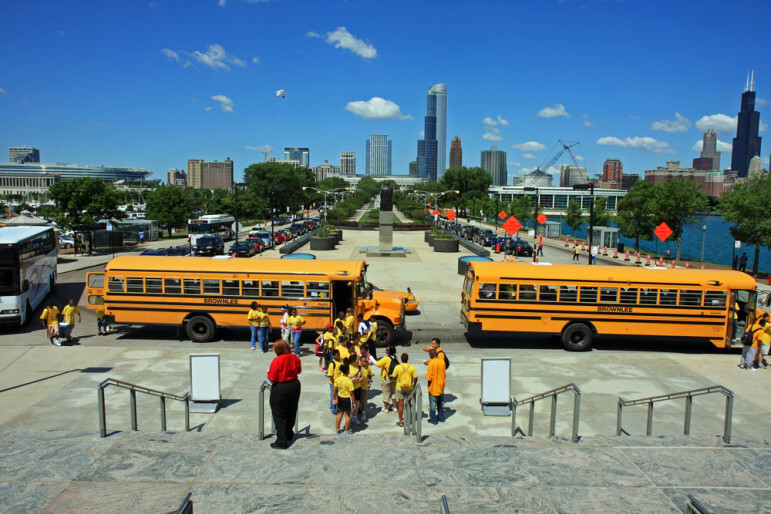 The issues under debate in these ongoing negotiations pale when compared to the much larger issues facing Chicago’s public schools—issues which cannot be solved by teachers and the school board. The district began the current school year with a balanced budget, but only after assuming it would receive half a billion dollars in new state funding to help meet its pension-funding burden. But with Illinois’s Republican governor and Democratic legislature unable to agree on a budget, these funds remain unrealized. Also stalled by the standoff in the capital are discussions on how to solve the problem of the seriously underfunded pension plan. Governor Bruce Rauner has been unwilling to move forward without agreement on “structural” reforms that now include a state takeover of Chicago public schools. In comments last week, the Tribune reports, “The governor…accused his old friend Emanuel of ‘kicking the can’ and costing taxpayers ‘more in the long run.’ Rauner argued that there are only two alternatives for CPS: bankruptcy [followed by a state takeover] or ‘massive’ tax increases.” Mayor Emanuel responded in kind, saying that the governor’s talk of bankruptcy and state takeover had caused the district to pay more in interest as it issued new bonds earlier in the week.